A new mode in this year's NBA2K12 was called the NBA's Greatest Mode. In it is a collection of 15 games containing some of the greatest players in NBA history. They range from Wilt Chamberlain to Jordan. The games are fun to play as the old legends of the game. As a Pacer fan, I was disappointed that it didn't include the Reggie Miller teams of the 90's and also disappointed that Charles Barkley is not in the game. It's said that there must be some contract issues but who really knows why they were left out. Aside from that, it's a great feature to add to the game and we had a lot of fun unlocking all of the legends to play whenever we wanted. The first step is in unlocking the greatest players in history is to play each game and win with the great highlighted for that particular game. Here is a list of the NBA's greatest in the game. Once you win, then you unlock the rosters for the teams listed. Once you unlock the teams, you can the use them in for Quick games. Once you unlock all 15 games, you can then use two players in the NBA's greatest mode. You don't have to use the greatest guy on the team. All you have to do is win. You can use any player. You can play on rookie mode so that it's easy. Play again on higher level to get more challenging play. If you preordered the game you can unlock 90-91 Warriors and Sacramento Kings 01-02 with the code you were given at the time of purchase. Unfortunately, once it's used, you can't use the code again. It was cool to see Phil Jackson as a player and we were disappointed that we couldn't see the shotstick in the Bill Russell game. My funnest game was scoring 98 points with Oscar Robertson. He has a sweet jumper. Another tip is if you want to play it quickly, play one minute quarters to go quicker through it. Since NBA2K12 was released, your Coack2K and his son "The Kid" have been playing this year's My Player. We have a lot of fun as well as frustrating moments with My Player but aside from a few issues we see, it is still a great part of NBA2K12. While I think a lot of people expect the game to be perfect, I'm old enough to remember Dr J and Larry Bird on the Commodore 64 and the Mattel hand held LED basketball game. Games have come a long way since then and so I have to say that for the most part I'm impressed even though I know things could be better here and there. That said, we know that there are a lot of fans of the game who want to know how to get the most out of My Player and so we decided we would take everything we know and discover and collect it on this page and call it "The Ultimate Strategy Guide To The NBA2K My Player Mode." It's my hope that you'll have all of your questions answered right here on this page. If there is something you want to know, please put your question at the bottom and we will make sure to include it here as well. What Is The My Player Mode? Should You Be A Point Guard, Shooting Guard, Small Forward, Power Forward or Center? Which Attributes Should I Raise First? How To Achieve The Milestones? Should You Request A Trade Or Play Out Your Contract? When my friend and I were younger, we envisioned a day when you could create yourself in the game, practice and get better and eventually play in the NBA game. (We took it a step further and imagined we would play against all other created players online which is kind of here as well but not quite.) While we dreamed this up in the early nineties, that day is now here. In My Player mode, you can create a likeness of yourself, decide what type of player you will be and get drafted by an NBA team. You then have a chance to earn more minutes, get into the starting lineup and eventually work your way up to winning and NBA title and becoming inducted into the Hall of Fame. Before you can start playing, your My Player career starts with "The Creation". This is where you will be able to customize your My Player and make him look the way you want as well as choose what position you want to play as well as what type of player you want to be. There are a number of sections you'll need to flip through to create your My Player. The first time through, I missed several options that I discovered earlier. Vitals - In the vitals section, you can pick your name. While you can pick your own name, we recommend using an alias in case at some point you take your My Player online you will retain some privacy. You can also pick a nickname. You can pick your favorite college as well. Probably the most important parts of this section are what position you pick to play as well as your play style. Obviously, you can pick a point guard, shooting guard, small forward, power forward or center. If this is your first time playing My Player, we suggest picking a point guard so that you will have more opportunities to handle the ball. While that will be your natural position, depending on the team that drafted you, you will most likely play as shooting guard some too before you crack the starting lineup. As you get more experience with how it works, our next position we would consider is center to learn how to post and rebound. As far as play styles go, if you go with a point guard, it might be best to choose 3 point specialist so you can shoot better right out of the gate. We still shoot poorly when we first start. Just keep in mind that you will get better the more you play as you acquire additional skill points to upgrade your attributes. As you do, you will perform better. Play Styles by positions: Point guards - All around, pass first, scoring, defensive, 3 point specialist, athletic. Shooting guards - All around, scoring, defensive, 3 point specialist, athletic, slashing. Small forwards - all around, scoring, defensive, 3 point specialist, athletic, slashing, point forward. Power forwards - All around, defensive, athletic, back to basket, face up, rebounding. Center - All around, defensive, athletic, back to basket, face up, rebounding.It's here that you will also pick what your number is, whether you are right or left handed. You can also choose four play types. At first, we use the default play types. Your age is also an option. You can be any age from 19-28 years old. We suggest starting at 19. Ultimately, if you have played organized basketball you probably have a general idea of the type of player you like to be (or wanted to be). Let that be your main guide. 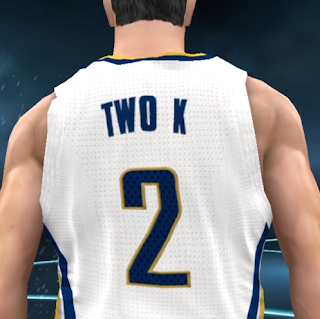 As My Player, I decided on Coach2K with a nickname of Mr. Fundamentals because I want to promote solid traditional game play for the most part. I also like to shoot the three. General - In the general section, the most important part of this section is your players height and weight. Point guards can be 5'7" to 6'7". Shooting guards can be 5'10" to 6'9". Small forwards can be 6'4" to 7'0". Power forwards can be 6'5" to 7'1". Centers can be 6'8" to 7'2". Because I wanted some height at shooting guard, I went with 6'7". As far as weight, I picked 225. For ideas on weight, look at actual players in the game to match up your weight to your height. The rest is just about looks. Head - More options on how you look. Hair- More options on how you look. Accessories - Things you can wear. I use team color one so I will match my uniforms. Tattoos - Various options for tattoos. Attributes - Once you choose your position and play style, you cannot change these. Abilities - Once you choose your position and play style, you cannot change these. Signature - In the signature section, you can customize your shot releases. This is something you can change later. What you will want to do here is use a shot release you can master. I personally use Gilbert Arenas. Shot timing is key to hitting shots. Once you have finished creating your My Player, choose a save file and move on. After you create your My Player, the first step in your upcoming career is to play in "The Rookie Showcase". The Rookie Showcase is your only chance to impress the NBA scouts (along with the pre-draft interviews) and affects where you will be drafted in the NBA Draft. The game is between the Rookie Stars versus The Elites. You will be on The Elites. My game was at Showcase Arena in New York City. It looks like the game is really at Madison Square Garden even though in my video it was called Showcase Arena. At the end of the 1st half, you will get a scouting report that tells you what you need to work on and whether your draft stock is rising, falling or staying the same. In Coach2K's rookie showcase, my team won 87-76. I had 12 points, 3 rebounds and 8 assists and received an A+ Teammate grade. I didn't shoot very well with 33% from the field and turned the ball over twice. The key to performing well is playing good team basketball. Take good shots, don't turn the ball over and get your teammates involved. For more information on how to get an A+ Teammate grade, see the section below that discusses how to get an A+. Just do the best that you can and move on. I received 1570 skill points in the game which I could use before I start my career. Once you complete The Rookie Showcase, you will be taken right to the pre-draft interviews. Here, you will be interviewed by three teams with picks in the first round. Each team will you ask you two questions. For each question, you will have a choice of four different responses. Depending on how you answer the questions, you might affect whether that team picks you. As far as what we recommend for pre-draft strategy, if you don't want to play with a team, say so if given the opportunity. Ultimately no matter where you go, you will play so it doesn't matter as much as you might think. Although some people prefer not to go to a team that is loaded at their position. As Coach2K, I was interviewed by the Warriors, the Suns and the Rockets. My strategy was to not play at Golden State and I said so. I was agreeable to playing with the Suns and the Rockets. In our experience, we have never gone to a team we didn't interview with. If you don't like the team that eventually drafts you, you can always request a trade after five games. After your pre-draft interviews, you will receive a report that projects where you will go in the draft. Coach2K was projected to go to the Suns with the 13th pick. Then, the NBA draft commences with David Stern hosting. Now that the lock out is over, the rookies are in the draft. We experimented with how high we could go in the draft as well as how low we could go. The Kid went as high as number ten to the Milwaukee Bucks and when he tanked The Rookie Showcase and got a Teammate Grade of F he went as low as number 23rd to the Houston Rockets. We think that you will most likely be drafted between the 11th and 18th picks. We also think that draft order has a lot to do with the position you play as well as the number of rookies at your position. Of course, in the pre-draft interviews if you tell a team you don't want to play there while telling another team you want to play with them, that could affect your overall draft spot. Your performance in The Rookie Showcase probably affects it as well. Playing horrible still means you go in the first round which is different from last year when The Kid did get drafted in the second round. As far as Coach2K, I went number 13 to the Phoenix Suns. When the draft is over, you will go straight to draft negotiations. As a rookie, you have little say over your contract as it is basically based on your draft position. It will contain what role the team expects you to play and will pay you the maximum you can be paid at your draft position. Coach2K was offered a $1.65 million dollar annual salary and a role as a bench player. The rookie contract is for two years. At the end of two years, you will be able to negotiate a new contract. Chances are you will be a much better player than when you first started and will be able to command a much higher salary. After you accept the contract, your rookie season will begin. Right before your rookie season, you will receive a welcome letter from the team that drafted you announcing your first endorsement. It's a billboard that says "The Future Has Arrived". We always joke that when you request a trade, it should say, "The Future Has Departed". After your contract negotiations are finished, the next thing that we did was go into and adjust them for the type of game that we wanted to play. The first step is to go into controller settings. I make the shot stick camera relative and always turn passing icons on, along with icon passing and total control passing. I then go into game mode settings and change it to the level I want, simulation mode, 12 minute quarters and run plays off. I still turn on the ability to see plays because out of bounds plays still use them. I personally leave autosave on. Some people like Chris Smoove recommend turning it off for the drills to get speed increases. I don't worrry about it. The most important thing to me was setting my quarter length to twelve. At first, when you are coming off the bench, you will only play about twenty total minutes. Later, the games will last longer but the additional time gives you time to get your Teammate Grade up. I think it's more like real basketball since that is what you would play in real life. Of course if you are short on time, reduce the quarter length. As far as playing level, I started on Pro my first season because I wanted to enjoy it. I may increase the difficulty level after the first season. I also use simulation over default. I'm a fairly new player (just started playing last year) so I started easier although I have won on Hall of Fame mode before with the Indiana Pacers. Just work your way up as you get better each year. The other thing that I like to do is turn off commentary and use the on court sounds maxed up. This makes me feel like I'm actually playing because if you think about it, you don't hear commentary while you are playing. But that's just me. It will save your settings once you set them if you have auto save on and you'll be all set. The next thing you will want to do is go into the shoot around section and work on your shot release. Make sure that when you go into shoot around mode that you adjust the settings so you can see the shot stick indicator and the shot quality. Then, once you have done that, start practicing your shot release. Practice so that you can get your shot release on the green. If it is red, it is too early or late. Watch the indicator. The blue circle flashes under your player to also give you and idea of when you should release your shot. After awhile, it will become second nature. Even once you get your release right, it doesn't mean that it will always go in. It depends on the defense, whether you are tired, where you took the shot from, what kind of shot you took and the game situation. Do your best to take shots where you have both feet set and are open. Avoid taking leaners, fadeaways and spin jumpers until your abilities reflect you can do those well and you have practiced them. Expect that you won't shoot well at the beginning of your career and expect that you will also miss layups quite often. It's just the way the game works. One additional My Player tip: Remember to utilize the shot fake in games. I also scrimmaged with the team once to get a feel for who was on the team. But I didn't do it again after that. I tend to practice in my games. Once you start playing games, your first goal is to win. Within that goal, your secondary mission is to play well so that you can get skill points to increase your attributes. These are then ways to increase your skill points. Do the drills - Doing drills gives you additional skill points. The drills rate you as gold, bronze or silver. Get a gold and get a plus one attribute for certain attributes. You don't have access to the drills all the time. You start off being able to do three. Then over time, you get additional chances to do the drills. I just do them in order as I get additional drills. Play games and play well - Playing smart by taking good shots, taking care of the ball, getting assists and playing good defense. Meeting in games objectives - Before each game, you will be given a list of three objectives that if you achieve them will give you additional skill points. Dynamic in game goals - During the game you will have a chance to achieve and objective based on the game situation to achieve additional skill points. Be named player of the game. Get an A+ Teammate Grade - Getting a top grade gives you more skill points. Achieve Milestones - Reaching milestones increases your skill points. The Key Game Multiplier - The key game multiplier doubles your skill points. By achieving more milestones in those games, you will maximize your skill points bonus. I just play within the game while trying to achieve milestones. Getting an A+ Teammate Grade should be your objective every time your player steps on the floor. If you get an A+ it basically means you played a complete game on both ends of the floor. It means that you played good defense, took good shots and worked with your team to do the best that you could do to win. At first, it might seem like getting an A+ is difficult but as your player progresses, you'll find it easier because he will be stronger and you will have more experience. Play 12 minute quarters. The extra time gives you more time to get your grade up. When the guy you are guarding has the ball, call for a double team. This works best if your guy is the point guard because he has the ball more often. As soon as they throw the ball in, call for a double team. On the PS3, you do that by hitting L1 for a count of one. Get your hands up and get up into the offensive player. You might tip the pass, steal the ball, get a jump ball or cause a turnover. Double team in the corners especially, when he is trying to cross the half court line and when your opponent picks up the ball.If he passes the ball, the moment he gets it back call for the double team again. Some players are great at avoiding the double team. Others find the open man who hits the shot. Do the best can to help your teammate cover the open guy. You might lose the possession or the game but will save your Teammate Grade. Don't let your guy score. The best way that you can accomplish this is to make sure he doesn't get the ball. Defend your opponent all over the court and don't help. If he does get the ball, call for the double team and force him to get rid of it. Don't take bad shots. Look to take open set shots off of pick and rolls. Avoid taking leaners, spin jumpers and fadeaways until your player has those abilities. Don't foul. If you constantly hit the steal button, you will get called for fouls. Just get your hands up by using the right stick. Get assists. Pass the ball to your teammates. Find the open guy by moving the ball around the court. The best way to get ball movement is to move to the part of the court where the player you want to get involved in the offense is. He'll move from that area. If he moves to the basket, hit him while he is cutting and he'll probably lay it in. Box out when shots go up. Get between your man and the basket and hold L2 and R2. Then try and time your jump to get the rebound. Set screens by using the circle button. Set back screens so your teammates can cut to the basket rather than screens that on the top. Don't call for pass. If you aren't open, it will only count against you. Don't try and take bad charges. The things above will help you get to an A+ Teammate Grade. Here are other things we found that impact your grade. These are the My Player milestones you want to achieve. The goal of My Player is to reach the Hall of Fame. In order to make the hall of fame, you have to complete 10 of the 15 following tasks. If you do that you will make the Hall of Fame. Over the course of your career, you will receive some endorsements. These are the endorsements we have received. Introductory letter with a billboard that says: "The Future Has Arrived".